Commando Editor Calum Laird is scheduled to give a talk at the Chalke Valley History Festival at Ebbesbourne Wake near Salisbury in Wiltshire. The talk entitled “Achtung! 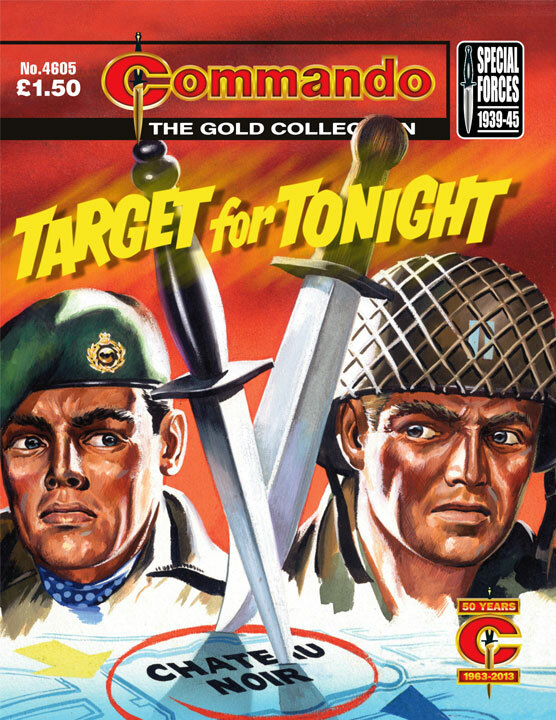 Commando Comics” will take place at 1130 on Saturday 29 June 2013. Calum will be discussing the history of the comic, the studio in Milan that provided many of the artists in the early years, and the quest for ensuring historical accuracy in all weapons, uniforms, aircraft and machinery. Tickets to the talk also include access to the Daily Mail Chalke Valley History Festival Airshow which takes place at 1430 at the same location on the same day and includes flying displays by various World War II military aircraft that Commando has featured over the years including the Supermarine Spitfire, Hawker Hurricane, North American P-51D Mustang, Fairey Swordfish and Messerschmitt Bf108 Taifun. The de Havilland Tiger Moth was a reliable, if rather old-fashioned, aircraft used as a basic trainer for RAF pilots. Pilots like Charlie Chard who was only recently qualified when he and his comrades found themselves in the thick of the action against the German Kriegsmarine and Luftwaffe. With four 1400-horsepower Packard-built Merlin engines powering them forward at close to 40 knots, the crew of MTB 989 felt like the raiders of old when they fired a broadside of torpedoes at enemy shipping. 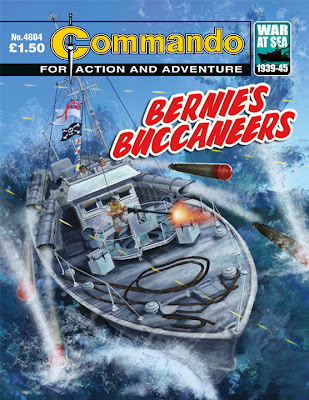 Privately they called themselves "Bernie's Buccaneers" after their fearless, swash-buckling skipper. They always said would have followed him into the jaws of death…and one day they did just that! When crack British Commandos were ordered to fight alongside ace American Rangers in a double strike against an important target, it sparked off the bitter, blistering feud between them that made the "other" war look like a petty quarrel. Here is the story of this war within a war; of Mike Travers and Red Dooley, who were tough enough to lead and control the best bunch of men that two great nations ever produced. "The names of Eric Hebden and Ken Barr are well known to Commando fans - for their gripping stories and dynamic cover art respectively," notes Calum Laird of this represented tale. "Once again, they don't disappoint. "This story of bitter, fist-fired rivalry is beautifully set up on the cover where the two main characters are pitched against one another… at daggers drawn, figuratively and literally. 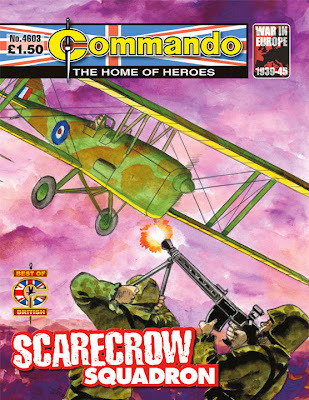 "It's different with illustrator who provided the black-and-whites for the inside pages for Roca drew only one Commando book. 50 years on it's difficult to say why that would be but it certainly wasn't due to lack of quality. He imparts movement to the figures and uses a scatter of original compositions. Who knows what he might have made of subsequent commissions?" Crash-landing a burning Blenheim bomber in occupied France would generally be reckoned pretty dangerous. And so it was, but compared to what fate still had in store for Harry Conway and his crew, that crash was a picnic! 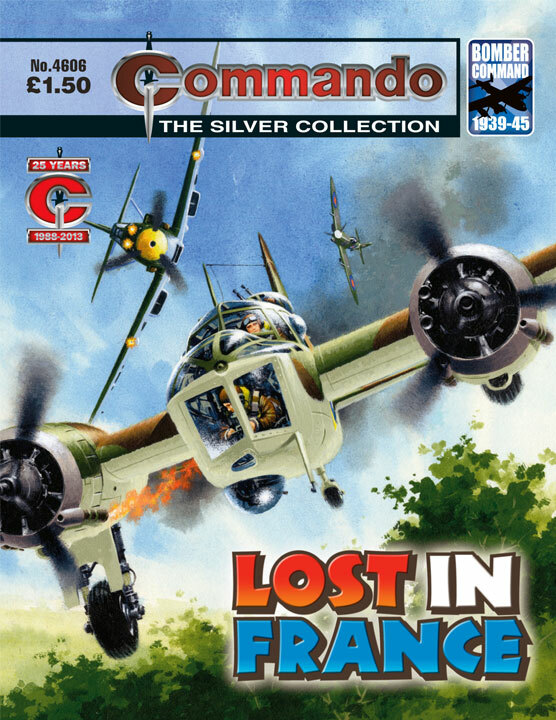 "Veteran artist Ian Kennedy's stunning, dramatic depiction of a crash-landing Blenheim bomber would, quite rightly, make the reader imagine that they were in for a rollicking air story," says Scott Montgomery, Commando's deputy editor. "It certainly starts off as one but, unusually, this tale takes an intriguing detour into espionage territory, becoming more of a spy caper - which suits Nebot's almost cartoony art. "It's a good thing when a few neat twists and turns can challenge readers' expectations."